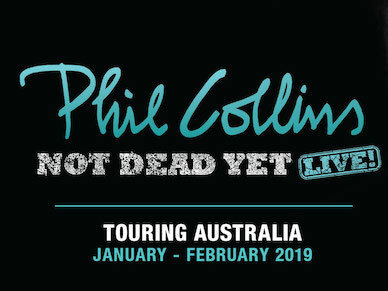 Phil Collins 2019 Not Dead Yet: Live! Global music legend Phil Collins is set to make his long-anticipated return to Australia with his Not Dead Yet: Live! tour in January & February 2019. A Telstra Thanks pre-sale, just for Telstra customers, starts on Thursday 30 August from 10:30am AEST. Click the blue button for further details. Tickets & VIP packages go on sale to the public on Wednesday 5 September at 9:30am AEST from Ticketek Australia.